Limited edition R8 becomes first Audi with laser light technology in the U.S.
As the sun sets on the 2016 SEMA Auto Show, the auto world now turns its attention to the upcoming Los Angeles Auto Show. That’s good because Audi’s getting a jump on the proceedings with the unveiling of the R8 V10 Plus Exclusive Edition, a 25-unit special edition R8 that legitimately qualifies as a special edition in our eyes because of the presence of laser lights. Yes, Audi’s advanced laser headlights are (finally!) making their way to the U.S. market and the R8 V10 Plus Exclusive Edition is the first model to get them. By that simple distinction alone, the special edition R8 already qualifies as one of the most important unveilings in Los Angeles, but as ground-breaking as the laser lights are, the R8 V10 Plus Exclusive Edition is also characterized by a number of features unique to itself. Safe to say, the 25 people who do end up owning one of these babies is fixing to get a treat once they take deliveries of their prized acquisitions. Care to spend that much on an Audi R8 that, in one very important way, is about to make history in the U.S? Updated 11/18/2016: We added a series of new images and a video taken during the car’s official unveiling at the 2016 Los Angeles Auto Show. 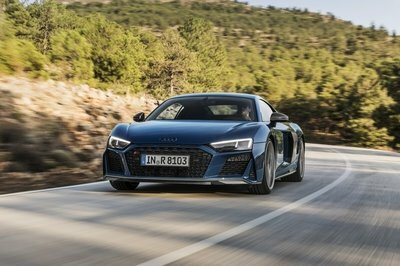 Continue after the jump to more about the Audi R8 V10 Plus Special Edition. Before we jump into the real reason why Audi is placing premium importance on the R8 V10 Plus Exclusive Edition, let’s first dive into its other special edition characteristics. 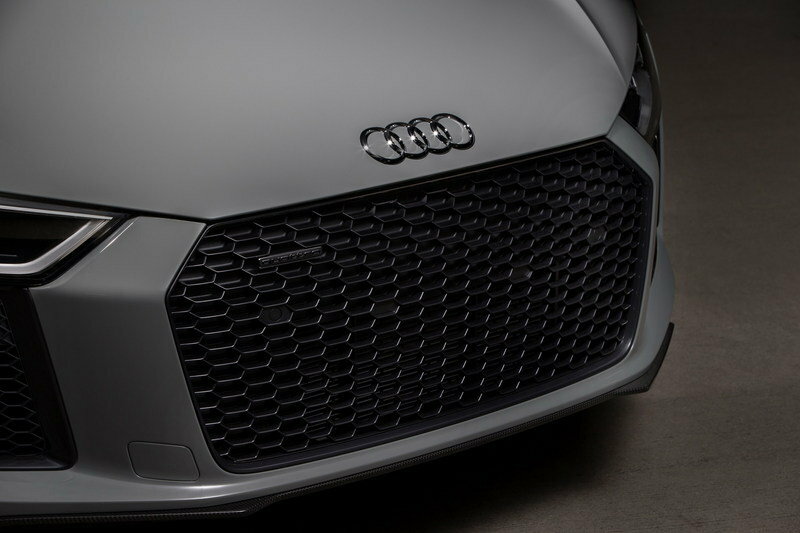 The first and most obvious is the Quantum Gray exterior paint finish, which Audi is highlighting as a significant addition to its exclusive program. 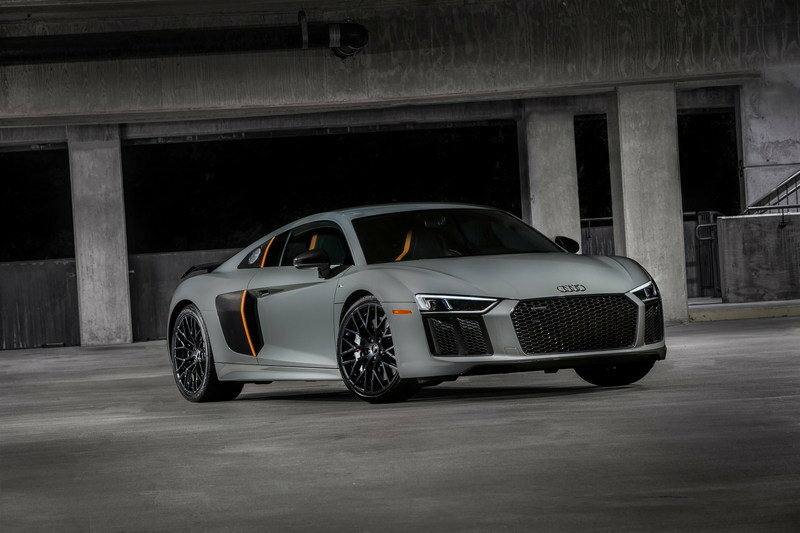 A Titanium Black-optic exterior package creates the monochromatic two-tone look of the body, which is only broken by the Solar Orange stripes on the R8’s carbon side blade. A new set of 20-inch, 10-spoke, Y-design, high-gloss anthracite wheels make up most of the exterior features of the limited edition R8. The first and most obvious is the Quantum Gray exterior paint finish, which Audi is highlighting as a significant addition to its exclusive program. Now let’s get to the one feature of the Audi R8 V10 Plus Exclusive Edition that really sets it apart from all Audi models sold in the U.S: the laser light high beams. According to Audi, the laser high beam is included in the entire headlight package, which is still largely made out of full LED headlights. Each of these headlights though come with a laser module that works in concert with four high-intensity laser diodes that are responsible for shooting out the laser beams, which the module bundles together, creating a blue laser beam that the German automaker says carries a wavelength of 450 nanometers. That process in itself isn’t the end of it; a phosphor converter comes into play and transforms the blue laser beam into a pure white light, which Audi proudly describes as “very bright.” Together with the LED high beam, the laser lights make up Audi’s new headlight configuration. Apparently, the laser lights have received the nod from the Department of Transportation, which is important since the National Highway Traffic Safety Administration has long stood by antiquated regulations that required cars to have high and low beams and nothing else. But if the DOT has approved it and the NHTSA falls under the DOT, then those regulations may already been relaxed in some form or fashion. Whatever the case may be, Audi’s laser light technology appears to be set to make its long-awaited arrival in U.S. shores. Considering that Euro-spec Audis have already had laser lights for a few years now, it’s about that time to we get the same spoils. The Audi R8 V10 Plus Exclusive Edition is the first Audi model to be equipped with laser lights in the U.S. and it appears that it won’t be the last. At the 2016 Los Angeles Auto Show, Audi of America will debut its first US production laser light on the 2017 Audi R8 V10 plus exclusive edition. The R8 exclusive edition utilizes full LED headlights, which are now supplemented by a laser high beam module in each headlight. 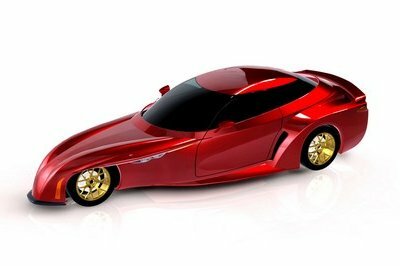 Each headlight contains one laser module that operates with four high intensity laser diodes. Each module bundles these diodes into a blue laser beam with a wavelength of 450 nanometers. A phosphor converter then transforms the blue laser beam into a very bright and pure white light. The R8 exclusive edition is also the first Audi vehicle to couple the laser light with dynamic front turn signals. Audi laser light is the latest production technology in a long line of lighting innovations from the four rings. Audi pioneered LED technology with daytime running lights on the Audi A8 L W12 in 2004 and all-LED headlights on the R8 in 2008. Lighting innovations such as dynamic turn signals, Matrix LED headlights (not available in the US) and now laser high beams are prime examples of how Audi continues to set an industry standard for automotive lighting technology. The 2017 Audi R8 V10 plus exclusive edition in Quantum Gray represents the full and extensive spectrum of what is available to customers through the Audi exclusive program. 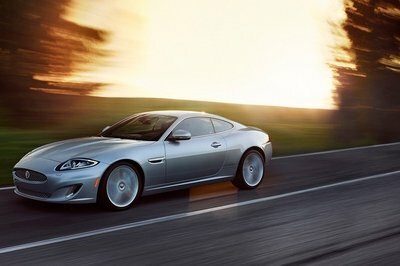 Quantum Gray paintwork aside, each exclusive edition gains a titanium black-optic exterior package which includes a gloss anthracite front grille and 20-inch 10-spoke-Y-design wheels in high-gloss anthracite finish. The R8’s carbon sideblade gets a Solar Orange painted vertical stripe, complementing the racing shell seats, which also boast vertical orange leather elements. 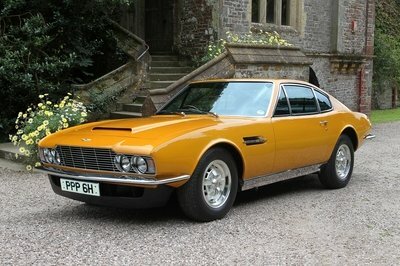 The full leather interior package in Black and Signal orange includes an Audi exclusive door sill trim in leather and a leather wrapped steering wheel with a Signal Orange 12 o’clock marker. 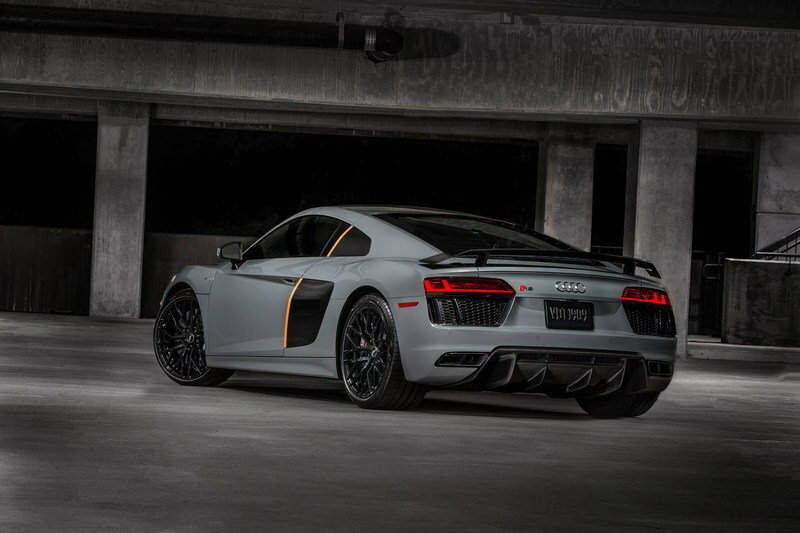 Each R8 exclusive edition in Quantum Gray is standard equipped with fixed backrest racing shell seats, Audi carbon ceramic brakes, carbon fiber rear diffuser, front lip spoiler, exterior mirror housings, and fixed rear wing spoiler. 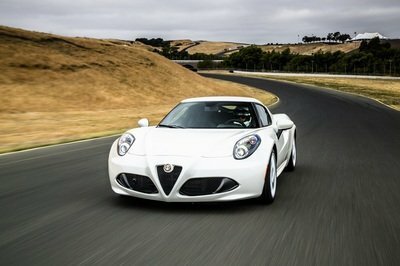 A total of 25 Exclusive Edition units will be produced with a starting MSRP of $229,200.